For over half a century, society representatives and other volunteers have been meeting once a month to exchange information and support each other’s activities. The leaders recognized that a coordinating group could enhance their ability to achieve their individual society objectives. Since community interfacing and various educational competitions are multidisciplinary, ACESA became the primary means of disseminating information and assisted in promoting these activities. Examples are organizational board & membership meeting notices, Workshops, Seminars, national & local conferences, Newsletter Distribution, Engineer’s Week, State and County Science Fairs (YES), Speakers Bureau, Legislative Interaction, Career Days, Teacher/ Student Awards Programs, and more recently the Future City and SMART Competitions, Science Olympaid, MathCounts, Arizona Junior Science & Humanities Symposium, Arizona Science Teachers Association, Arizona Science & Engineering Fair, Intel International Science & Engineering Fair, Governor’s Celebration of Innovation Student & Teacher of the Year awards, Arizona SciTech Festival, numerous schools STEM fairs, Engineering Summits, developing partnerships with The Arizona Technology Council, Arizona Commerce Authority, Arizona Department of Education, Science Foundation Arizona/Arizona Science Center & Challenger Space Center, etc. ACESA is the only local and/or state umbrella organization that supports, promotes and coordinates the programs and activities of the professional/technical societies of Arizona. The existing infrastructure includes the monthly meetings, participating in joint society gatherings, hosting Engineering Summits, a large mailing list (over 100 contacts), a web presence, Facebook & LinkedIn pages, etc. By reaffirming their membership and appointing liaison representatives to ACESA, the societies will reap the synergistic benefits associated with common issues/concerns. The initiative to use the ACESA infrastructure must come from the societies/organization/individual members. The mission of ACESA is to support, promote and coordinate programs and activities of the engineering and scientific associations within the State of Arizona through facilitated communication and leadership support. Expand and support interest in engineering and science for students in Arizona’s public and private schools and universities. Build public awareness of the depth and extent of engineering and science companies and associations within Arizona. Provide Arizona’s professional engineering and science associations a means of communicating their activities, attracting members, and building partnerships to further their respective missions. Serve as a central communications hub for professional associations to consolidate and publish relevant information in support of associations’ missions. Provide stimulating programs and activities for member organizations at monthly (quarterly) meetings. Actively seek out and engage in support activities that broaden and deliver value to association members through delivering useful services to public and private activities related to engineering and science. The following information was obtained from the ACESA history files, which includes minutes of meetings, newsletters, the ACESA constitution and by-laws, as well as other documentation included therein. Personal contacts and other outside sources were also used. The organization was originally formed in February of 1956 when representatives from the various Arizona professional/technical societies met to nominate Arizona’s Engineer of the Year. At that meeting, in addition to the nomination, the representatives discussed and agreed that there was a need for a supporting organization which would allow the individual societies to communicate with each other. That organization became ACESA. Prior to that, there were 2 professional organizations performing this service, The Engineering Joint Council (have been unable to find any previous information/history of this organization) and The Engineering Council for Professional Development, (renamed ABET in 1980) that was established in 1932 as an engineering professional body “dedicated to the education, accreditation, regulation and professional development of the engineering professionals and students in the United States”. In January 1958, a ”Chart of National and Local Engineering and Technical Societies and their Interrelationships” was developed (by Lucile B. Kaufman, Chairman of Publicity Committee, Arizona Section, ASME) and it reflects the initial organizations involved in the formation of ACESA. It also reflects their ties to their national organizations. 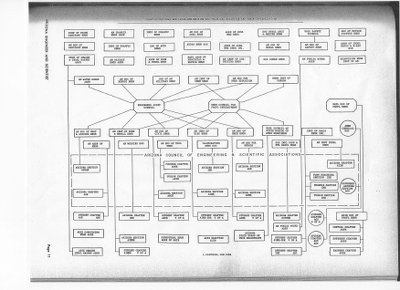 The 1958 Organization Chart is shown at the top of this page. Develop a monthly joint magazine for all societies. To bring various societies closer together and promote the interchange of ideas, programs and professional activities. Combine the efforts of all societies on any project for the good of the engineering profession. Develop programs to encourage students to follow engineering. To become better acquainted with individual members of all societies. To bring the member societies closer together and promote the interchange of ideas, programs, and activities. To combine the efforts of member societies on suitable projects for the advancement of the engineering profession. To encourage students to enter engineering and scientific careers. To study the problems of engineering scientific education and its need for all communities and to recommend and endorse the expansion of our engineering and scientific educational institutions as required. Should not interfere with internal affairs of member societies. Over the years, the name of the organization has changed slightly from the “Arizona Council of Engineering and Scientific Associations.” It has not varied much, and it always returned to ACESA. Robert H. Hartley, American Institute of Electrical Engineers (AIEE), was selected as the temporary chairman. Within a few months, he was transferred from Arizona by his employer. Mr. T. A. Phillips, AIEE, then became the first official elected charter chairman. The next society to join was the Institute of Radio Engineers (IRE) followed by the American Institute of Industrial Engineers (AIIE) in 1957. (Click here for a complete officer listing). The above information was gathered by Hal Rice, the 1984-’85 ACESA State Chairman, on March 8, 1986 and was edited by Sheryl Emhoff from the Phoenix region and Bryan Cowan of the Tucson region. A copy of this original edition is located in the 1986 history file. A listing of the past member society organizations has been assembled and listed on a separate page (FIXME!!). The initial listing was compiled by Fred Bernstein on August 3, 1986. It is not a complete listing, but contains those we have been able to identify. It contains 33 organizations. (Click here for this listing). In the early years, ACESA published a bulletin/periodical/magazine called “The Arizona Engineer and Scientist.” In August of 1968, the name changed to “The Southwest Engineer and Scientist.” It was a very professional looking and well written periodical; (copies are located in the Arizona Room, Burton Barr Public Library, Phoenix, AZ) (See Volume Listing by clicking here). Some very dedicated individuals contributed much effort to making it what it was. The first issue was published in May of 1957; the last known issue was July 1971. The first issue contained 8 pages, with later issues up to 36 pages. In the first publication printed on page 4 of the April 1957 issue, ACESA President Mr. T.A. Phillips wrote an introductory article entitled “WHAT IT IS AND WHAT IT DOES”, explaining the purpose of the organization and fundamental aims of the Council. That article can be accessed here by clicking here (FIXME!!) Also in the first publication printed on page 3 of the April 1957 issue, the Secretary Mr. W.E. MacMorran wrote an article explaining about the first meeting of the group and a task force was setup to draft a constitution for the organization. That article can be accessed by clicking here. Prior to 1972, there was only one ACESA organization for all Arizona. Most of the state chairmen were from Phoenix, but at least one chairman, Paul Hanover, in 1971, was from Tucson. In about 1972, the two regions, Phoenix and Tucson, started to become independent regions. Initially there were two vice chairmen, one from Phoenix and the other from Tucson, with one general chairman for the state. It continued that way for a couple of years, and then the two autonomous regions came into existence about 1975. They existed this way into the mid ‘90’s. Currently only the Phoenix chapter continues to be active, and is starting to grow again under the leadership of the new president Matt Blair (SME). Some key bullet items are listed below and reflect some of the activity ACESA were involved in and/or performed. This reflects information that is contained in our history files, for which we have data and also information obtained from past members, libraries, etc. The earliest file we have is 1975. Thanks to Jim Soudriette, who had kept his personnel files, dating back to 1975 and up thru 1996. Also thanks to Chuck Terrey, Ed McBrien and Charlie Hoyt (now both deceased) for providing some of their records and files. Ray Quackenbush and Everett Greenli also provided information from their personnel files from 2006 to 2013. We have many years where no information is available. Anyone who has any old “records” (newsletters, minutes of meetings, emails, etc.) and would like to share them, we would appreciate getting them to add to the history file. 1981 - The earliest record on file shows the official regional by-laws was adopted on June 20, 1981 (copies located in the 1981 history file). They contained 10 specific articles, as follows: I. Name; II. Objectives; III. Territory; IV. Membership (including dues rates; V. Officers; VI. Meetings; VII. Executive Board; VIII. Committees; IX. Parliamentary Authority; and X. Amendments to the Bylaws. 2004 – October29, 2004, Articles of Incorporation paperwork filed. 2005 – February 1, 2005, incorporation paperwork approved and assigned File Number 1162489-0. 2006 – 1st Qtr. – start filing annual reports to the Corporation Commission. 2006 – February 3, 2006, received acknowledgement of our request assign ACESA Employer Identification Number 20-3471143. 2006 – March 7, 2006, received official notice of exemption, with an effective date of October 29, 2004. 2007 – started e-Posting annual IRS returns.